Today we've released upgrades based on your input and our own observations. We hope you like them. Thanks to all of you who have offered suggestions. We have even more suggested features to be released later. Comments are now a news feed. The latest comments show at the top. This will make managing employees so much easier. We noticed that email for employee login was not ideal. Some employees don't even have an email address. But the real issue, to us, was the complication. Now, employees only need a PIN and a Company ID to log in for the first time. After that, they simply enter their PIN number. It can't get much easier than that. Webtimeclock 2 had the ability to add multiple groups, which were basically independent sub accounts. A handy feature if you have more than one pay period, or if you have separate, independent locations. Now you have the same feature, except we call it Companies instead of Groups. Unlike Webtimeclock 2, we now have the ability to enter administrators for your sub Companies too. 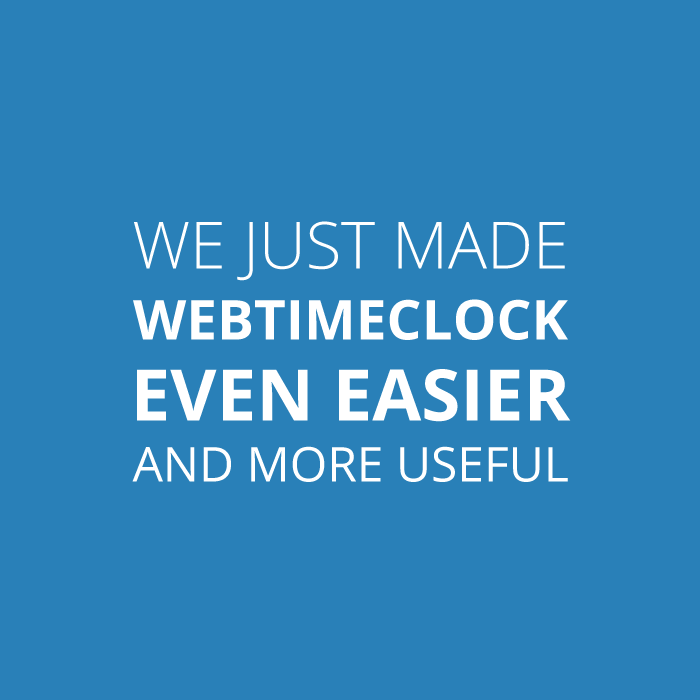 If you ever used Webtimeclock 2, then you know about our easy navigation. With Webtimeclock 3, the challenge was to keep the navigation easy, but add a ton more features. We got it close, but not close enough. Now our naviagation is more like Webtimeclock 2. All the important tabs are front and center. One click to see timecards or summary reports. The problem with converting minutes to decimals (hundredths of an hour) is rounding. For exmple 29 minutes is actually 0.48333333, not .48. Because of that, if you added a column of decimals, it would not always match the total. Why? Because we were recording in minutes, which had to be converted. The answer was to not record in minutes. But in decimals instead. Now when you add down a column, it should match the column total.